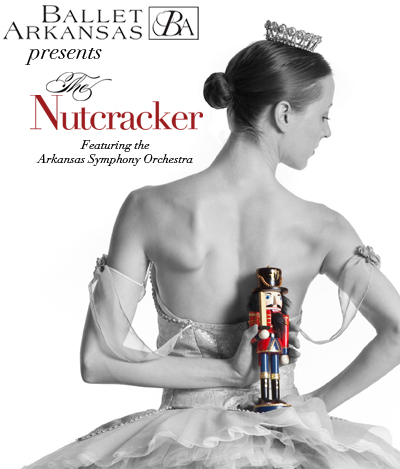 Celebrate the season with your professional ballet company as we continue a favorite Christmas tradition performing The Nutcracker accompanied by the Arkansas Symphony Orchestra, conducted by Maestro Geoffrey Robson. Every year this fun field production creates lifelong memories for hundreds of Arkansas families. With gorgeous scenery, enchanting costumes and original choreography, Ballet Arkansas will present The Nutcracker at Robinson Center Music Hall on December 7th – 9th. The Nutcracker tells the story of Clara and her magical nutcracker doll and their wondrous journey to the Land of Snow and Kingdom of Sweets. This year’s production boasts new choreography from Ballet Mistress, Marla Edwards, new to the company this season, as well as co-director Allison Stodola Wilson. These directors along with choreographers Traci Presley and Jana Beard have taken this much loved holiday favorite to new heights creating an enchanting production that will delight audience members of all ages. This year’s production will feature the nine professional company members of Ballet Arkansas, comprised of Anna Maris (Arabian/Dew Drop), Sean Porter (Arabian/Russian/Rat King), Lauren McCarty Horak (Spanish/Marzipan), Paul Tillman (Snow King/Russian), Katchiri Tillman (Snow Queen/Marzipan), Amanda Sewell (Doll/Marzipan), Laurel Dix (Chinese), Toby Lewellen (Nutcracker Prince/Russian/Spanish) and Leslie Dodge (Sugar Plum Fairy). In addition to these nine company members, Ballet West Principal Artist and Ballet Arkansas Artistic Advisor, Michael Bearden, will grace the stage, dancing the roll of the Cavalier. Other corps rolls will be danced by Ballet Arkansas II company members Akiko Kyong-McClain, Mysti Kirkpatrick, Rachael Schwartz, Haley Jones, Laura Russell and Elizabeth Wing in addition to 175 other Arkansas students and performers. The Nutcracker is the perfect yuletide gift, the ideal means of introducing children to the power and beauty of classical dance, and a delightful way for the entire family to ring in the holiday season. Make Ballet Arkansas’ Nutcracker part of your holiday celebration this December! To purchase tickets for the December 7th, 8th or 9th public shows to The Nutcracker, visit www.balletarkansas.org or call 501-666-1761. Tickets range from $20-$45. Ballet Arkansas performances of The Nutcracker are generously sponsored by: Orthodontic Associates, Little Rock Convention & Visitors Bureau, Arkansas Democrat Gazette, Pleasant Ridge Towne Center, The Dance & More Store, Arkansas Times along with support from the Arkansas Arts Council. 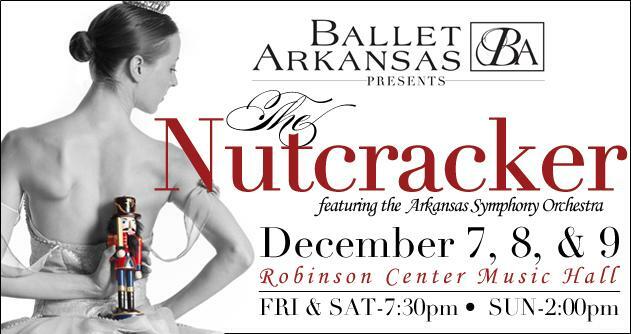 Ballet Arkansas continues the tradition of presenting The Nutcracker this weekend at Robinson Center Music Hall. The title role is being essayed by Ballet Arkansas company trainee Jake Catlett while Michael Bearden, Ballet Arkansas’ artistic adviser, is a guest artist and dances the role of the Cavalier. Alternating in the role of Clara are Lauren Frances Wood and Kathryn Latham. Other roles are being danced by Leslie Dodge (Sugar Plum Fairy), Lauren McCarty Horak (Snow Queen),Toby Lewellen (Snow King), Anna Maris (Frau Von Stahlbuam and Dew Drop Fairy), Sean Porter (Rat King), Stephen Stone (Drosselmeyer), Allison Wilson (Rat Queen) and Perry Young (Herr Von Stahlbaum, Mother Ginger). The choreography for this production was created by a Jana Beard, Sydney Ippolito, Marius Petipa, Traci Presley, and Allison Wilson. Geoffrey Robson, associate conductor of the Arkansas Symphony Orchestra, will conduct musicians from the ASO in performing Tchaikovsky’s ballet score. Tickets are available from the Arkansas Symphony box office at 666-1761 or http://www.arkansassymphony.org.